HALLIE EPHRON: Like many of you, I see the pictures of neighborhoods devastated by Hurricane Sandy and wish I could help. My daughter Molly was out this weekend in Sheepshead Bay, a neighborhood on Brooklyn's waterfront, helping with the cleanup. She tells what it's like. I camped out out on a spare mattress in my sister and brother in law’s apartment, mostly for the company. Neither of us live in evacuation zones. We listened to the wind, watched the news, argued about whether the constant coverage was frying our brains, whether it was alarmist and whether we should watch NetFlix instead. ConEd called and said our electric might get cut. Then downtown Manhattan went dark. But our lights in Sunset Park stayed on and I baked cookies and we watched a documentary about sushi-making. In the morning, on the news things looked bad, but our Brooklyn neighborhood did not. A few trees down. I went home, fed my cats and took a nap. In my neighborhood stores were open with fully stocked shelves. Restaurants packed. Except for the fact that the traffic was unusually thick, it was almost like a snow day. We met up for dinner and drinks and believed the appropriate agencies would fix the broken things because this is New York and this is what happens here. Then the mayor announced that school would be cancelled for two more days—a full week. And the lights stayed off downtown. And the news from the disaster areas got worse and the marathon got cancelled and cops started having to patrol gas stations so anxious drivers didn’t beat the crap out of each other. And when the lights finally went on, it didn’t mean that everything was back to normal. Not even close. I didn’t understand how bad it was at first. I don’t know what it’s like for anyone outside of New York but for those of us who live in New York City who weren’t directly affected by the storm surge, it’s been a slow reckoning, part naiveté, part willful ignorance, in part a function of just the way this city works. To live in a New York neighborhood is to be a citizen of a very small geographic area, to which you have loyalty, and where all of your goods and services are provided. Because in my neighborhood we continued to have, I didn’t immediately understand how different the situation is for people just a few miles from my apartment. ... I went with a group of friends to volunteer in Sheepshead Bay/Coney Island. It’s not just bad. It’s beyond bad. Driving south from my apartment for a while there is still “the normal.” Grocery stores open. People walking dogs. Hassids walking to Sabbath services. It’s like that for about a 15-minute drive from my apartment. And then it gets just the slightest bit quieter. And then you start to see the garbage piled up in front of the apartment buildings and houses. Couches. Mattresses. Debris. And it’s like that in front of every single building, everywhere you look. And then the traffic lights aren’t working. And then you start to notice that the cars lining the curb are all filled with mist, some of them kissing bumper to bumper, a pile of waterlogged sludge nestled in between. And the businesses that at first appeared to be open actually have people in them because they’re clearing out their entire livelihoods, taking out soggy files and cash registers. And there are no lights, just flashlight beams flickering out from internal spaces. ... what “storm surge” means. It means “where the water came in.” If you weren’t near the water, Sandy was loud and windy but not particularly terrifying. And if you were in the way of the water, God help you. Volunteer opportunity posted on FacebookMy friend Katina forwarded it (http://www.facebook.com/CleaningSheepshead?ref=stream). Just something that went around, no real organization identifiable. A young guy who identified himself as a resident of the neighborhood had been going around to local businesses, seeing who needed help. A real angel. He handed out assignments. We had followed the instructions and brought rakes, gloves, face masks and garbage bags. I had spent a good 20 minutes that morning staring at the garbage bag options at C-town trying to decide which strength to buy. Being somewhat indecisive, I bought a mélange, some Hefty, some generic. 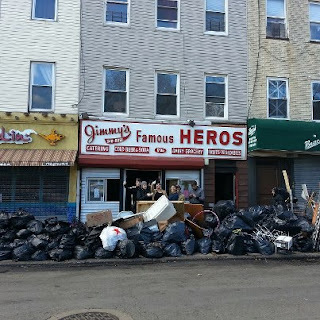 We got sent to a sandwich shop called Jimmy’s Famous Heroes (photo by Janine Feczko) where the proprietor’s instruction was just “throw everything out.” The chips we asked? Yes. The shelves? He pointed to the wet walls and floors. Sewage. Everything had to go. The owner told us: “The shop would have been 75 this year.” “It will be!” offered a volunteer. Nobody contradicted this. We cleaned out the deli case, whole hams, huge cylinders of provolone, pickles, soggy bread. The file cabinets had water in them. The owner asked if he should keep a waterlogged book on Joe DiMaggio. “Is it signed?” someone asked. It wasn’t. Throw it out. It turns out people really say these things when horrible things happen. Because that’s what there is to say. The trash bags turned out to be useful. Heavy contractor bags are good for things like files and hams. Crappy generic trash bags are good for cleaning out shelves full of potato chips. After we were done at Jimmy’s we went over to another place identified by the organizer, the Warbasse apartments in south Brooklyn, several 23-story buildings all part of a City middle-income “Mithchell-lama” complex. On the first floor, in one lucky building with power, volunteers sorted random relief foods (canned pork, popcorn) for residents. FEMA was there too but it was unclear who was coordinating what. As a group of four we took an assignment sheet with a building number and a list of apartments and needs for each: foods (some kosher), blankets, water. We collected the needed supplies from the supply tables then headed out, and immediately realized we had no idea which building we were going to with our 50 pounds of relief materials. We met a kind French biker named Andre who biked around until he found the building for us, then let us strap a crate of Poland Springs to his bike rack to ferry it over. We went in through the loading dock. A kid in a sweatshirt—a super?—told us water would hopefully be coming back on that day, but no electric. There had been no electric since Sandy. Then he showed us how we had to bring up the food—the windowless stairwells of a 23-story building. We looked at each other. We hadn’t thought to bring flashlights. But it’s the modern age. Cell phones have lights. And Andre’s bike helmet had a little head lamp. So that could work. We entered the stairwell and climbed in the dark, tripping at first, stumbling with vertigo, then getting the hang of how to share the lights efficiently and quickly grab the banisters. We knocked on the first door of our assignment list, and were greeted by an older, very overweight couple who mostly spoke Russian. They were clearly happy to see us. We gave them their food bag and some water. Then the man asked “Orange juice?” “There’s apple juice” my friend Elana said. “Diabetics,” the man explained. Crap, we thought. We quickly dug through the other bags and found whatever we could with additional fruit sugar and made a note on the assignment sheet that they needed to be checked on again and brought OJ. In the other apartments, it was a mix of needs. Everyone in need was elderly, some more elderly than others. They were riding it out not out of stubbornness but because they literally couldn’t get down the stairs. There was the woman in her 70s who told us she had her 96-year-old mom in the back. There was a younger woman with her older, seemingly senile mother, a cat and a bird. No one had been out since Sandy hit. One woman asked if she could use the water to flush her toilet. In some hallways, it was clear from the smell that in some apartments, toilets had not been flushed. The residents put in additional orders for food and water, and when we told them we didn’t know when electric was coming back on, they started to ask if someone might help them get out. But it was clear they didn’t really want to go. And where they would go, none of us knew. We dutifully took note of their requests to give to the volunteers/FEMA. When we were done, Elana and I drove to Coney Island. “I just want to see it,” she said. We parked and walked by the aquarium and wondered about the animals with their delicate swimming tanks, about little Mitik the baby walrus who had just arrived. The boardwalk was covered with sand, the beach with random detritus. Futon frames. Sheets. Someone seemed to have made some art out of the debris, a dog house with a rug placed perfectly in front of it and a set of shelves. The Wonder Wheel sat silent, it’s underground controls soaked in sea salt, same for the other rides. The wind roaring through the giant steel structures sounded to me like an adult walrus crying. I was happy to figure out it was just wind on metal. But still. Eerie. But it was also beautiful. The late fall light saturated everything with color, the rides extra bright, the water dark blue green. A million fat seagulls standing around like nothing had happened. And then we walked by a fried food stand and suddenly realized, it was open. The people behind the counter were actually serving food. Corn dogs, fried shrimp. A full display case of golden fried deliciousness. I talked to the owner. They hadn’t had any damage, he said because they were high up, higher than the workings of the Wonder Wheel. They were OK. Full electric and water. That’s great! I said. I bought onion rings and lemonade even though I wasn’t hungry. And I was grateful. We kept walking down the beach to where a crowd was gathered. Dozens of people with shovels clearing off the boardwalk. The organizer was standing on a table telling people that it was time to pack up for now. “But we don’t want to,” one older gentleman protested. The organizer gently told him that they would meet again tomorrow at 9 a.m. There would be plenty of work to do. HALLIE: I hadn't realized how bad it is until until I read this. Here are some links to organizations that will help you help, too. Anyone who has any additional suggestions, please post them in comments. These days I find myself saying, “So glad you are safe” before I ask what I can do first to help. Everyone seems shell-shocked here . . . Sandy has moved on, but her devastation continues to be displayed as if we needed to see the pictures in order to know what has happened. Pictures we don’t need . . . we merely have to open our doors. In our small corner of the Jersey shore, we are, thank God, safe . . . but the devastation is literally “just down the road.” We share what we have with those who have lost so much. In the face of all this, it seems that the only thing Sandy couldn’t take from us is the indomitable human spirit. For all the wonderful people like Molly and her friends, “thank you” does not begin to express the overwhelming feeling of gratitude for those who have come to help. But it is all many of Sandy’s victims have. Thank you. Joan, I talked to a friend in New Jersey yesterday and "shell shocked" is the perfect description. They have their power back, but they are anything but "fine." Molly, thank you for your report from the front lines. My heart broke for the stranded elderly. When I read about your diabetic couple, I realized some may even be running out of medications by now. Let alone meds that have to be refrigerated and electrically-powered breathing support equipment, OMG. Anyway, bless you for your service. Me again. Forgot to tell you, Molly, how much I appreciate your list of agencies accepting aid AND that your list reflects a range of options for involvement, from in-person and hands-on to financial donations. Thank you, Molly. This is a great piece of reporting. I know these areas well, and my heart breaks for so many in so many parts of NY. Well, this apple didn't fall far from the Ephron writing tree. What an amazingly well written piece, Molly. Thank you for sharing your experience and the description of what the people themselves are going through. That was the bit I've been searching for, in my daily quest for more information on this horrifying disaster, how the victims are faring now, and what is being done to help. And thank you for spending your time and energy to help. It's great to know about young people who are willing to go out of their (your) way in service to others. First off this native Brooklynite thanks you for your efforts! And thanks for listing the links and info on how to help. The Times (and Mayor Bloomberg) have been saying stay home, send a check instead, but it seems clear - especially from the Cleanup Sheepshead page - that there is a need for people on the ground. Hopefully i can find a gas station that actually has gas. I'm really shocked how little coverage is being given to the devestation in NY/NJ. If not for firsthand reports like this, of which I've seen only one or two on other blogs I'd assume it wasn't so bad. When Katrina hit I was glued to the news as was everyone else so we knew just how bad things were. With this, nothing. A large heavily populated portion of our country is in need of help. The most powerful way to do that, to get people up in arms and helping is media coverage. Do you think this will change after the election? Jennifer, there have been numerous articles and photo essays of the destruction online. I don't get cable, and since there's an election I've been avoiding TV, but there has been plenty of coverage about Sandy, as far as I know. I do think the election is a big enough news story to push this to one side. After the election I'm hoping things will have gotten so much better that there isn't a story to follow. Right now Molly is trying to get in from Brooklyn, connecting through the only line running up to Manhattan from Brooklyn. Hoping she checks in with what that's like. Thanks so much for this, Hallie and Molly. Such a clearly evoked portrait of what the situation is like on the ground for far too many people right now, especially the elderly and poor! I especially appreciate the list of places to send help for those of us elsewhere in the country. All I've been hearing is "Red Cross." I know from personal experience in disaster (and have seen that even some NY/NJ leaders have been vocalizing it) that too often the Red Cross uses disasters for fundraising and very little of that help gets to those who need it most. There are usually much better alternatives to be sure your help is going to help someone who needs it. Bless you for helping out, Molly. I wish I lived close enough to do the same. I will send all I can to some of these agencies you've listed. Let's all remember that the need is not going to go away overnight, even when the news cycle changes. Thanks guys. It's really unclear to me why the media isn't painting a clearer picture of what's happening on the ground. We went out to the Rockaways yesterday and it's dark, cold, and getting colder. Still lots of people out there in huge, very dark buildings. Not nearly enough official relief presence (FEMA, Nat Guard, Red Cross) for what appeared to be a huge amount of need. Lots of volunteers with a lot of heart but not a lot of coordination. I'm worried for them. Here are a few links about the situation there, courtesy of my good friend Alice Lincoln. Molly.Thank you. You are a blessing. CLicking. DOnating. And counting blessing. Thank you for doing it, and thank you for sharing it all. Molly, having *very* clear memories of Hurricane Ike (hard to believe it has already been four years ago), you have my deepest and sincerest respect for your efforts. It is amazing what becomes important in circumstances like this, and how little it really takes to help out and lend a hand. Absolutely terrific piece...thank you Molly. Like the folks you met and helped, you have a good heart. Let us count on good and generous hearts to help our dear friends in this tragedy. Your article was heartfelt and insightful to those of us far away from NY. Thank you, Molly and Hallie, for sharing this. The pictures on the TV news and online newspapers are ont hing; on-the-ground observations quite another. I hope your return to work goes smoothly, and that your friends and co-workers are safe, too. Thank you, Hallie, for posting this and for raising such a good daughter. I was all the way in Hawaii when it happened and felt so powerless that I couldn't help in any way. There are a lot of good people in the world and Molly, you are one of them. Thank you. Thank you Molly and Hallie for sharing this. And thank you for the links to ways we can help. Words fail me. What a great piece of writing. Molly, thanks for doing this and, I agree, you're a natural writer. Now that we're mostly dealing with the aftermath, there is another unfortunate part of that process people need to be aware of...the opportunists. I wrote this about a week ago before the storm had even fully passed, but it might help a few people avoid losing even more. Avoiding scams and cons in Sandy's aftermath. That's scary and informative, Terry - thanks for the link. Thanks, Hallie and Molly. What a great first-hand account. I was so worried last week about friends and relatives in Manhattan and Brooklyn. I watched CNN non-stop (I NEVER watch daytime TV) waiting for the power to come back on. But now, the aftermath is horrendous, and people will depend so much on volunteers like you, Molly, and your friends. Thanks for the aid links, and thanks, Terry Ambrose, for the very helpful article. As one who is from the Gulf Coast that is regularly dealing with hurricanes, this is getting a lot of press, especially considering it was not a hurricane when it hit. Last Monday, while driving between Ohio and St. Louis, there were already Power & Light companies on the road toward NY/NJ preparing to assist in the expected power outages. In the town in Ohio where I live, the P&L companies were expecting effects of Sandy to put power out here and so were not sending convoys east. But Sandy was not as strong as Ike, so that didn't happen. No power loss in Ohio from Sandy as far as I can tell. I have friends across the country relating how their spouses and others have gone to NY/NJ and are working relief. Katrina was an eye-opener to the nations, but when Ivan hit Pensacola FL the year before, there were still trash bags on the street and piles of debris (no other name for it) 3-4 months later. What Molly has highlighted with the photo is that one shop only has to throw out all those bags. For a city that is built vertically, how many piles will each building contribute and how long will it take for the garbage collection to pick through the debris. FEMA was there; that's good. But our disaster planning post-Katrina and post-911 should be better than it was, and I hope this also goes toward improving it for the future. Refilling meds is part of hurricane-prep and so is filling tubs full of water, but if you've never seen this, how will you be paranoid enough to do all the prep suggested? Thanks for sharing this, Molly, including how you and your sister rode it out comfortably and then learned how lucky you all had been that it wasn't a hurricane, much less a level 5 hurricane (or 3 or 4, which are more common). Bless you! I went through some serious hurricanes in my youth. My childhood bedroom had water stains on the ceiling for a while from Betsy. This is powerful and moving. Bless you for your work and compassion, Molly, and for sharing. You're right Diane. Sandy wasn't a hurricane. But that's part of what's been so weird about it. The water came up, the water went down. The parts of the city that are fine are pretty fine. The parts that aren't: grave infrastructure damage, severe isolation, not nearly enough emergency assistance, no real timeline for restoration of services. Sandy wasn't a high level hurricane. It was really its own animal. I fear we've only seen the tip of the crisis. I really hope I'm wrong and just being alarmist. I really do. How terrific of you to volunteer. And what a great post. My brother is still without power in northern New Jersey, and has not been able to get to his shore house (because its on a barrier island) to see if it even exists. He tells me the night club in Ortley Beach where I used to waitress in the summer was completely ripped apart. I can't imagine what this is doing to people's lives and people's businesses. Molly... so very moving. Your post is like a photo of feelings. There is nothing on television here about the storm, other than a few stock photos that were televised since the beginning. I have found nothing as informative as your article here, online. Thank you. Thank you. Thank you, Molly. And thank you, Hallie, for bringing her here. Diane, I was interested in what you had to say about refilling medical prescriptions. It seems like a critical thing to do, and it is logical, of course. There is, however, a major barrier in following through with this as part of a disaster plan. If a community is fortunate to have enough warning, the cost of refilling prescriptions early can be prohibitive for most people. Pharmacies in a given community can easily run out of popular prescription meds quickly. In fact many pharmacies do not stock many common medications. They are, rather, delivered to them from a central location. Many people depend on their prescriptions by mail, because insurance companies usually offer incentives for ordering in large quantity. This can work to your advantage if it is the beginning of your prescription cycle – but to your disadvantage if the disaster is headed your way towards the end of your prescription cycle. I try to stay ahead of my own prescriptions by one month. How I have done this was painstaking and perhaps dangerous, because the only way I could do it was by skipping doses each week to build up a stockpile in advance. Every new medication brings a new need to do this, if I am to be prepared for an emergency. This is something I am passionate about, since I was trapped with my husband and children, on the wrong side of a flood that, daily, washed trees and boulders past our house, as the edge of a cliff got closer and closer. We were stranded for over a month on our ranch in California. I had one day's worth of seizure medication and one EpiPen for our daughter, when the sheriff flew overhead in his helicopter, stuck has bullhorn out the side, and asked if we needed any prescription medications. What a harrowing story, Reine. I knew to fill the bathtub but I didn't know why. And I had never thought about prescription meds. But of course. Seems like a good reason to try to stay at least one refill ahead of what you really need. And many insurance plans will not allow you to fill prescriptions ahead of time. I know mine won't allow refills until there's only 5 days left of the month for that month's prescription. I've built my own emergency supply the same way you have, Reine. Taking slight chances in order to be covered under bad circumstances. My heart breaks for every person hit by Sandy. Thanks Mollie and Hallie. Many up here in Morningside Heights wondered how to get downtown to help. Finally word came - Riverside Church at 120th and Claremont is collecting anything you have to offer: clothes, bedding, baby things, dishes, and sorting and packing and trucking to Staten Island. Bring and stay a while to help. Open all day tomorrow Tuesday. Thanks for the info, Francine -- Makes you appreciate the "Heights" in "Morningside Heights." They are pretty spectacular and deserve huge props for their amazing mobilization efforts and seem to be rising as a good example of efficient coordination. Linda, my insurance plans won't cover early refills either, so when I left for Oxford several years back, I had to pay cash up front (hundreds of dollars), only to have the meds disappear from my luggage between check-in and arrival at Heathrow. I had scripts with me that, while not refillable in the UK, were a helpful guideline for the doctor. A similar thing happened on the way to Denmark. Fortunately, I was able to get refills there and in France, just by showing the pharmacists the scripts and by signing my life away. None charged me any money, either, although each pharmacist said they would have to. Molly,thank you for not only writing about what people are going through but for volunteering to help with cleanup, too. I am in CT, a couple of blocks up hill from Long Island Sound. Many homes in our community were severely damaged. Many are the same ones that were damaged by Irene. Some people whose homes were damaged by Irene have not yet been able to move back home. Sandy just made things even worse. For me, this storm was just an inconvenience. I did not lose my power. I am one of the few people I know who never lost power. Nearly all my friends and coworkers did. ALL of my relatives did throughout PA, NJ, and CT. There is some water in my (shared...it is a condo) basement, but it is by no means a flood. There was flooding in my complex, including the basement in another part of my building. The water had to be pumped out. Yet there were just large puddles in my section. I count my blessings every day. FEMA opened a temporary office in town today and will be here until Sunday evening. My NJ sister, like Jan's brother, is still without power. They hope to have it restored by Thursday. She teaches in a private school. There was no school last week and she does not know when the school will reopen. First they need to have power restored. Because it is a private school, the students are from all over the area. The administration believes that a good number of students may have been displaced by the storm; with phone service still being sketchy, communications have been difficult. On Saturday I was finally able to reach two friends who live in different towns on Long Island. One of them was still without power. Both of them talked about how fortunate they are compared to other people on Long Island. One of them was setting aside clothing to bring to a donation center. neighbors just a couple blocks down from me who lost so much. I also thank God for people like you who are putting yourselves at risk to help with cleanup efforts. Deb, thank you so much for your post. My heart goes out to you and your friends and neighbors. My son played MarioCart all night in Queens, taking a brief break to climb out on the roof of the deli next door to rescue their AC unit's cover that had blown loose and was banging against the wall of their apartment. He works in a theater in lower Manhattan, so had the week off. I've sent him the link to this so that he will have links to volunteer groups. You put this very well. We experienced Ike down here in Houston and had cousins who stayed on Galveston Island during that. Harrowing beyond words when the water comes in. Thank you to Molly for the article and to Hallie for sharing it across the airwaves. A wonderful report of a terrible situation. It makes me realize how lucky I was here on Long Island, going without electricity for 5 days and having my house sustain minor damage. The people you are helping lost everything. And some of their lives are still in danger. Kudos to Molly and the other volunteers doing what they can in such a dire situation. I have to put in a word for the Red Cross. Money that goes to them isn't earmarked for Sandy because they can't work that way. They had volunteers setting up shelters all along the east coast before Sandy even hit land. At the same time, they're still helping people burned out by wildfires in the west, plus the many individuals left homeless by smaller tragedies. Your actual dollars might not go to their efforts in New Jersey and New York, but they will allow them to keep working there without worrying that the till is empty when a blizzard paralyzes Chicago and leaves thousands without heat. And I can't stress VOLUNTEERS enough. Thousands of these folks left their own homes in threatened areas to set up cots and stock water bottles and snacks just in case they were needed. So definitely support the on-the-ground, smaller efforts that make sense to you, but the Red Cross will spend millions on Sandy clean-up that needs to be replaced for the next time they are needed. Reine, Good info about the meds. I haven't reached that stage yet, but know my parents have. When Isaac hit P-cola, it took 3 days to get word on anyone. A friend whose cell phone started working called me, then drove by my mom's to see if they were okay. My brother went home and got free generators when a neighbor, who'd tracked some down and brought them back with him, found he had no need for them. His house was gone. My brother had built his house in the past two years and went above the latest hurricane code requirements by about a foot, and the number he'd calculated as having to beat was where the Cat IV Hurricane came in at as it crossed at Orange Beach AL. We'd been thru one that wiped out the stuff beach side before. Now I see all these tall Condominiums that were probably built with "rebuild" money and stuck as eyesores on the once-beautiful Perdido Key and recall the book "Condominium." It's good that most cellphone are working and the towers are up. Communications are tough when one is isolated. Next to watch for is gouging as had happened in Florida (same year as Isaac) when those three hurricanes crisscrossed the lower part of the state. Things that you run out of (ice, plywood, water, fuel) go up in price. And where will you put the debris? I'm still wondering where the Japanese put the debris from the Tsunami last May. I've only seen what's on TV. We are lucky, we got power back after two days. Guy next door shared his generator for fridge. We send him over goodies from the up right freezer were couldn't save the food from. Passed things on to two other neighbors also. My sister inland a little futhrer in Central Jersey, not near the coast, still doesn't have power. They are cooking on a stove top and have a fire place for heat. They are now down to using canned goods for food. She is in an area that has large, old trees and they may be without power for another month. Trees and wires everywhere means you don't get out of your neighborhood due to blocked roads. They are just thankful that the house is sound and they made it through. Worried about checking closes for coats and gloves they can give away to people in need. Our two gas stations in town just opened today. Hubby took old blankets from the garage, washed them, and donated them to the pet shelter that flooded. Wish they'd been good enough to five to people. Unfortunately, we'd been downsizing and had donated an excess coats, bedding, clothes, etc., so we had nothing left to pass on. We have friends who lost everything. Its been a nightmare but we will help them and move forward. Thank you for voluneering and for writing this piece. I too old and crippled to volunteer, but I will pass this on for others to read.